4224469 Snowtrooper Key Chain is a Star Wars Key Chains set of a Snowtrooper, released in 2004. 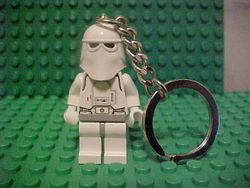 This is the same set as 850352 Snowtrooper Key Chain and 4224469 Snowtrooper Key Chain. Facts about "4224509 Snowtrooper Key Chain"